Lefty Gomez was one of the first baseball players to become a fan favorite for his ability to amuse fans and not just his playing ability. Although he already had the nickname "Lefty," he would earn another as "El Goofo" because of his joking nature. He was famous for using the expression "I would rather be lucky than good," but Gomez didn't really need to worry about being "good" as his five world championships attest to his success. This list of the top Lefty Gomez cards examines the options from his remarkable playing career as well as some of his more recent releases to find the best of the best. Shop for Lefty Gomez Cards on eBay. 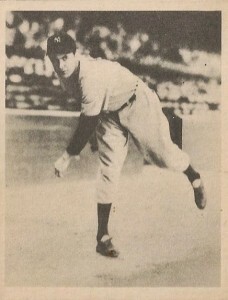 Gomez's most famous pitching achievement occurred in 1934 and 1937 when he won the prestigious pitching triple crown twice while playing for the New York Yankees. During those two years, he was the league leader in wins, ERA, and strikeouts and you might even give him the "quadruple crown" as he also was also the leader in shutouts both seasons. Lefty Gomez was inducted into the Baseball Hall of Fame in 1972 and his election was undoubtedly due to his high winning percentage over his career of .649. He was even a perfect 6-0 over his seven starts in the World Series. Gomez is also the answer to the baseball trivia question asking who won the first ever All-Star Game in 1933. Remarkably enough, he also drove in the first run of the game which was unusual because Lefty was one of the worst-hitting pitchers of all-time. While they are generally the most popular Lefty Gomez cards, issues from his playing days are always at a premium and so collectors with a smaller budget can look to some of these newer releases. The black-and-white 1994 The Sporting News Conlon Collection offers several cards of Gomez in his Yankee pinstripes. Gomez, like most Yankees greats, is featured in many cards from the 2008 Upper Deck Yankee Stadium Legacy set that can be found in nearly every 2008 product put out by Upper Deck. 2015 Panini Diamond Kings includes several die-cut and parallel Lefty Gomez cards, along with some incredible relic cards featuring Gomez and Lou Gehrig. Without a doubt, Lefty Gomez makes some important baseball card appearance, including his iconic 1941 appearances in the Double Play and Play Ball sets. The top list below tries to balance those clear favorites with some of Lefty's more accessible baseball cards in order to build a perfect collection. For those looking to start a collection based around a Hall of Fame player from the 1920s, 30s, or 40s, you would be wise to take a look at both the 1960 or 1961 Fleer sets as they include affordable options for some of the biggest baseball heroes. Those sets also nicely bridge the gap between new release cards and those original appearances from many years earlier. In Gomez's full body shot from the 1960 set, you can see he was tall and lean at 6'2'' and an approximate playing weight of 170 pounds. 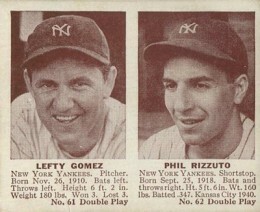 Lefty Gomez's 1940 Play Ball card shares nearly an identical design to his 1941 appearance (see #1 on the list), trading black-and-white photography for a color painting. 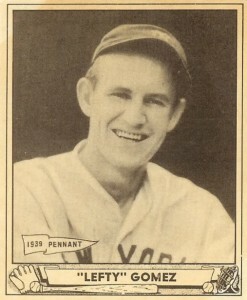 You'll notice in the lower left corner, Gomez's card includes a "1939 Pennant" flag denoting that the Yankees represented the American League in the 1939 World Series against the Cincinnati Reds. 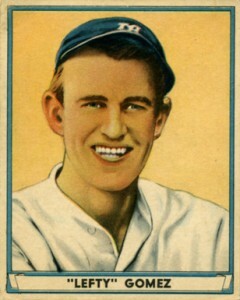 Players for both teams have the pennants included on their 1940 Play Ball cards. 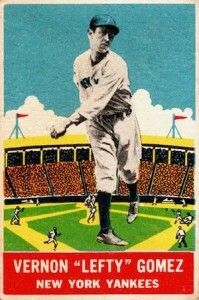 In 1936, Goudey issued an over-sized set of premium photo cards to compliment their smaller 25-card set. 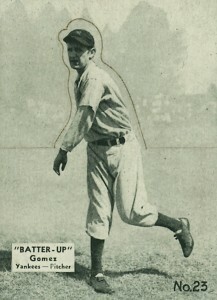 These larger cards have become known as the "Wide Pen" set because the lettering used for the player's signature is wider than was typically used in other sets. Nice copies of Gomez's un-numbered portrait card can be found for about $100 at auction. Lefty Gomez died in 1989, so tracking down an autographed item was normally limited to signed baseballs until Upper Deck began including Gomez in their SP Legendary Cuts series. Gomez cut signature cards can be found in nearly all of the Legendary Cut sets, allowing collectors to seek out the design that they personally prefer. 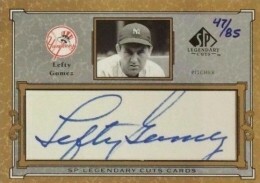 Gomez had a rather large signature, with a flamboyant "L" and "G" as you can see from the card featured below. Featuring a pitching stance, this Gomez card is found in the iconic Playball set from 1939 that revolutionized the photography on baseball cards. The reverse side of the card has him listed as "Vernon Gomez" rather than his famous nickname Lefty, and you can find many grammatical and typographical variations on his card and many others in the set. The differences don't really affect the overall value of the card as all versions can reach several hundred dollars in well-graded condition. Lefty Gomez appears to be warming up on his 1933 Goudey card. This is clear because Gomez had a powerful in-game windup in which he would bring his leg nearly up to the letters on his chest as he pitched. 1933 saw the beginning of a remarkable stretch for Lefty in which he would make his first All-Star team and the next six beyond that. Very rough copies of his card can be found for about $50 and go up from there for better examples. 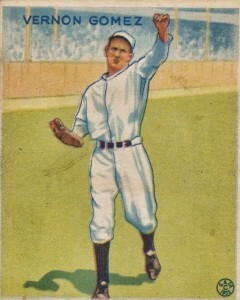 Lefty's card in the Batter-Up set, issued by National Chicle, is in the first series and so it is a bit easier to find than the higher-numbered cards in the set. 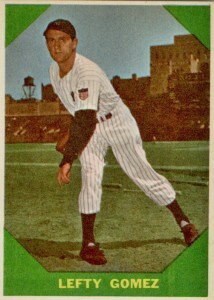 The cards in the first set were also a quarter-inch taller than the later-series cards. Copies that haven't been folded (as they were intended to be) can reach into the hundred at auction. When a graded copy of Lefty Gomez's 1933 DeLong appearance comes up at auction, they will often reach the highest prices obtained by Gomez card. The small set size and vibrant colors have made this a very popular set. Adding to the interest, the black-and-white image set inside a drawing of a active ballpark gives it a very distinct look. The 1941 Double Play set, which features two teammates on one card, can sometimes strike gold by featuring early pre-rookie card appearances of two Hall of Famers. This was the case with the card featuring Gomez and Yankee's shortstop Phil Rizzuto, who played together in 1941 and 1942. 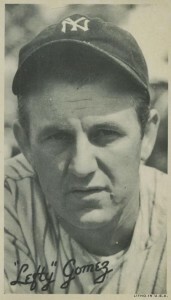 Gomez would retire from baseball the following year and Rizzuto would join the Navy and serve for three years during World War II. Although the year 1941 has been ascribed to the last Play Ball set, the later half of the set (cards #49-#72) may have been issued in 1942. On the reverse of those cards, the copyright year was removed from their design, bringing into question the date of their issue. Lefty's card #72 was the last card issued in the three Play Ball sets and near mint graded copies can reach $1,000+ at auction. 2006 SP Legendary Cuts Lefty Gomez Autograph Auto 27 36 Yankees HOF Signature!! 1936 GOUDEY "LEFTY" GOMEZ(HOF) SGC 60 5 EX, FREE SHIPPING!